Many apps and games come with Facebook integration, and the only way to let them use your account is by logging in to your Facebook account of course. What are the chances that your password is absolutely safe? It’s not just hackers who could steal your password, some malicious apps or games could very well do that. How do you prevent this? Fortunately, the solution comes, from none other than the social network itself. These are one time passwords that you generate while logged into your account. You can use these passwords into the app/game of your choice and gain its Facebook integration benefits, while staying safe. This ensures that your primary password, the one that you use to login to Facebook on your browser, remains secret. These are very similar to the application password system used by Google’s 2-Step Authentication service . 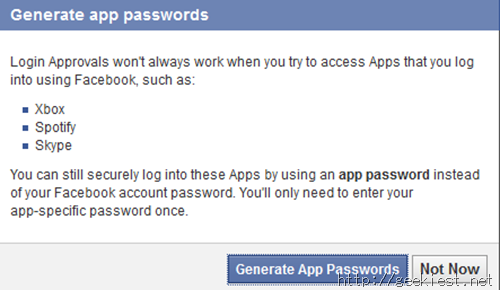 How to set up a Facebook App Password? 1. 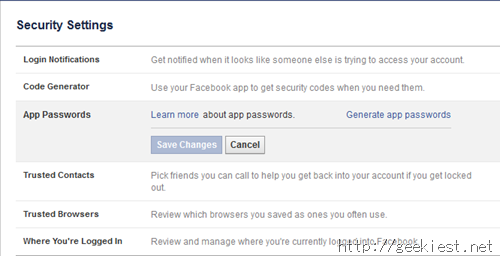 Login to your Facebook account on your browser and navigate to the Settings. 2. Now click on Security, and then on App passwords. 3. Click on Generate App Password, you will be asked to enter your current (primary) password as a precaution. Just a little bit of extra security. 4. Enter a name for the App you want to use the password for, and it will generate one for you. Just use it to login to the app of your choice. You can remove existing passwords, from the App Password section. Hope you find this tip helpful!